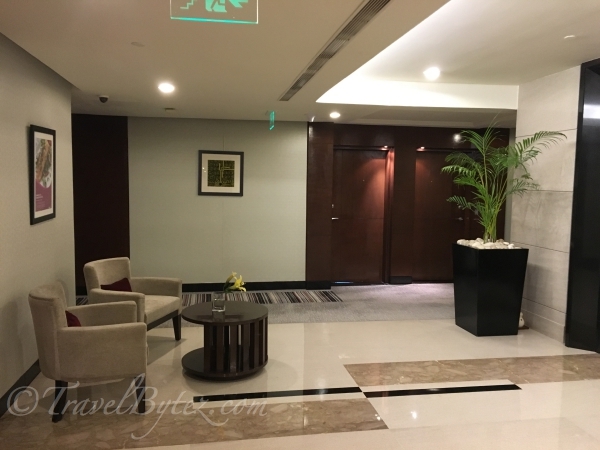 Being a business hotel rather than one for leisure, Crowne Plaza Gurgaon, New Delhi, is quite a distance from the main attractions but for those doing business within the vicinity of Gurgaon, it is a convenient location to be. There are also a few attractions such as the Kingdom of Dreams within the vicinity, so it is not really that secluded. With so many people, having to organize transportation from the airport to the hotel was a little of a hassle. Thankfully a colleague in India managed to get (all 14 of us) us complimentary transport from the airport to the hotel. When my colleague and I arrived at the Delhi airport, the driver was waiting for us at the arrival hall with our names (along with the hotel logo) for identification. I was already pretty tired, so I had some difficulty locating our names, but my colleague was still alert enough to spot our names. With luggage in tow, we made our way to the carpark where our ride was awaiting us. According to the driver, he had actually waited for us for 2 hours! The flight had gotten slightly delayed (for about 30 minutes), but he was already at the airport long before that. I cannot imagine the drivers that had to wait for my other two colleagues whose flights were delayed for a couple of hours. Needless to say, we gave our driver a tip for his hard work (plus he did help me tow my somewhat not so small luggage). The moment we stepped out of the airport, a humid breeze greeted us and continued to follow us to the car. Traffic was not so bad at that time of the night (about 10:30pm), so it was about a 25 minute drive from the airport to the hotel. When we arrived at the gates of the hotel, the car was inspected for security reasons (with all the bombings going around these days, this action does add a layer of security). 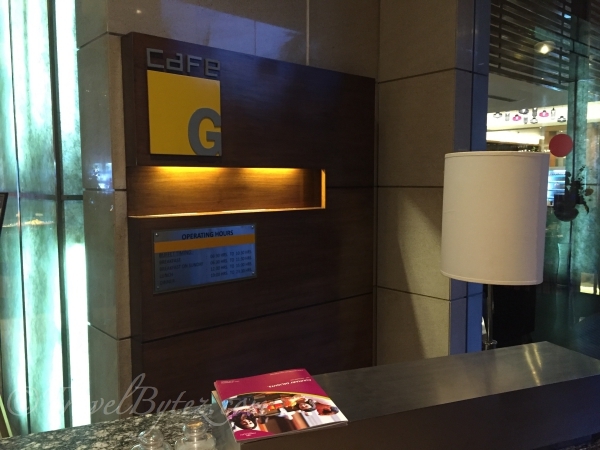 Once we cleared the main gates, we were alighted at the lobby entrance, where we had to scan our bags before entering the hotel. This action was a daily affair and implemented upon all guests who wanted to enter the hotel; after a while we got used to it. As there were some prior arrangements, the check-in process was smooth and relatively fast. The both of us were issued our rooms within 10 minutes. Once the check-in was confirmed, our credit cards were blocked for the rate (that was agreed upon) and it would be charged to the cards once we checked out. Unfortunately we were not able to be on the same floor, my room was on the 5th floor while my colleague’s room was on the 3rd floor. 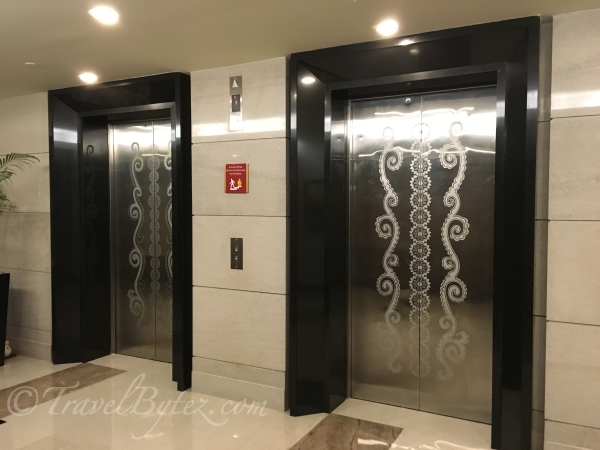 , Over the course of our stay, I learnt that our group of about 14 people were scattered between floors 3, 4, and 5. The porter helped us to tow our luggage to our rooms. 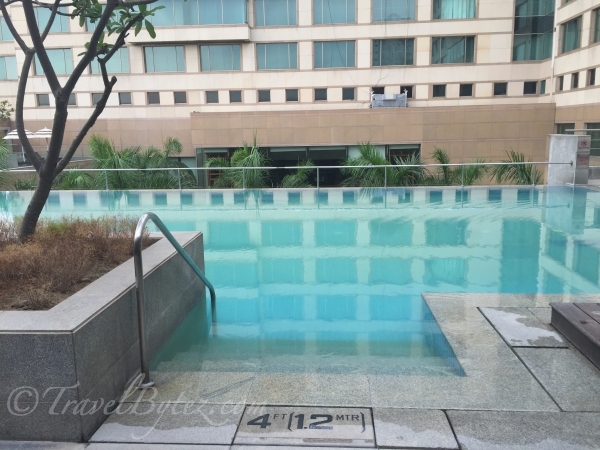 I tagged along with my colleague to check out her room, which was basically not much different from mine except the floor it was located on and the view (I think she had the city view while I had the pool view). The only main difference I could see was that the lock on her door was of a different design. In order to get to the rooms, your room card is required to be slotted in, and it only allows you to press the floor which your room is located on. The pool from the onset looked beautiful, but a close up revealed slightly murky water and certain parts of the pool tiles were tinged yellow (don’t want to think about how it became that color). Not exactly inviting waters to swim in, but there were still people who swam in the murky waters. 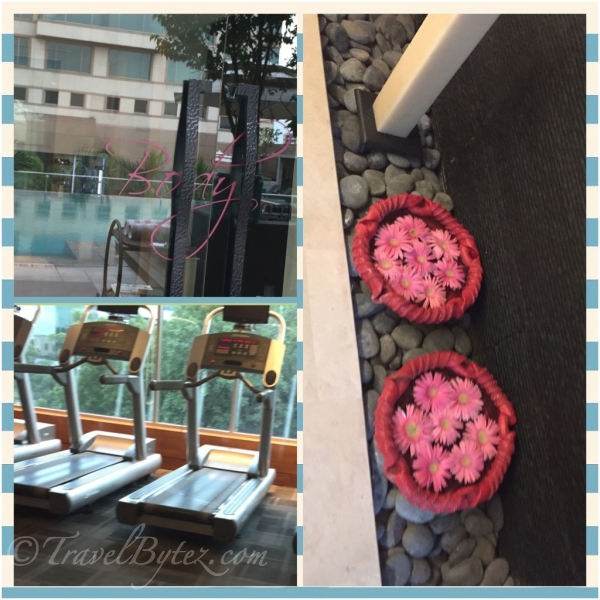 The gym seemed to be well equipped with treadmills and whatnot. But as a female, entering the gym that has too much (and only) testosterone is a bit shocking (Indian guys lifting weights can be an intimidating sight). Not to mention the long walk that one has to take to get to the gym makes it all the more unappealing. As for the spa, there just wasn’t enough time to explore the place so we give that a miss. But given the nature of the trip, which was business, I doubt I would actually use the facilities. 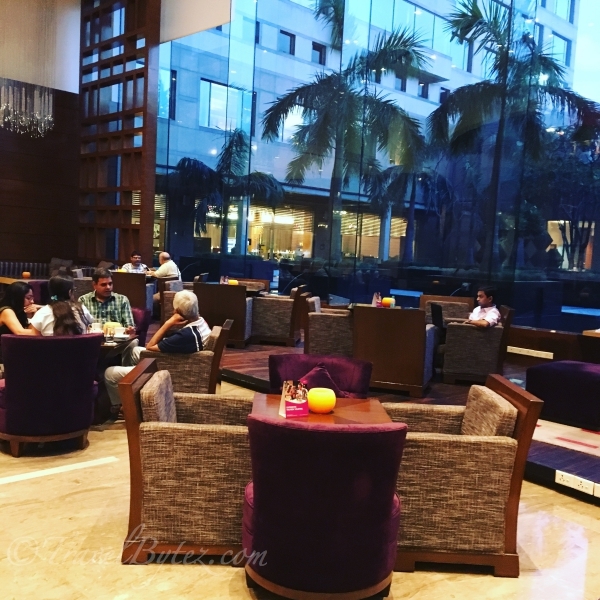 Although breakfast was touted to have options of Indian, Asian and Western food, it was fairly limited when compared with other hotel breakfasts. 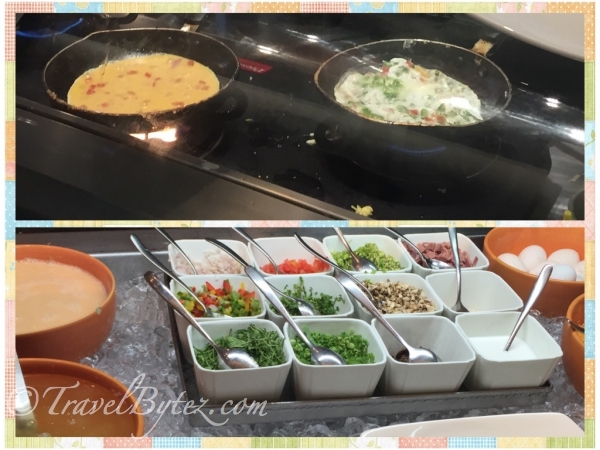 There was my favorite Egg Station, so that kept me pretty satiated during my stay. However, if you are expecting to be dazzled by the variety, don't get your hopes too high up. The food was palatable and there were even small adorable bottles of water you could take with you if you wanted. But other than the atmosphere and service, the variety of food options is not really a lot. My favorite station... The Egg Station! Besides the pub and (2) restaurants, there is also a little souvenir shop within the hotel premises. Perfect if you do not have the time to get anything but need to get that little souvenir or two. 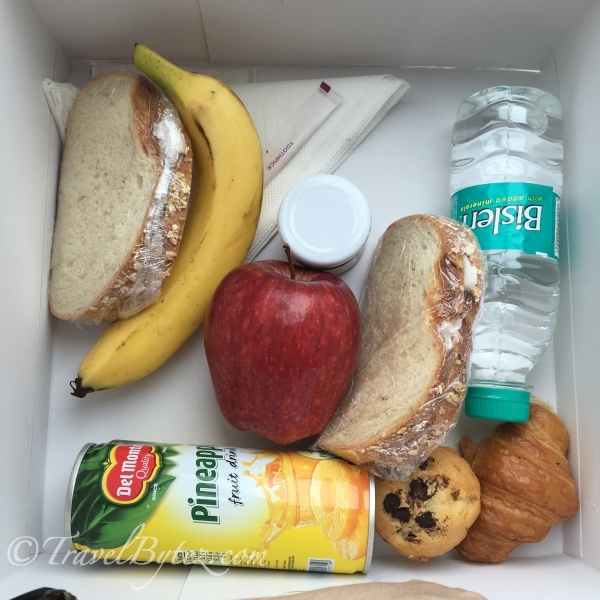 On our last day, the hotel so kindly packed us breakfast for our morning trip to the Taj Mahal at 6 (!!) in the morning. Well, we did charter a bus from the hotel, but the spread they provided for breakfast deserves some kudos. 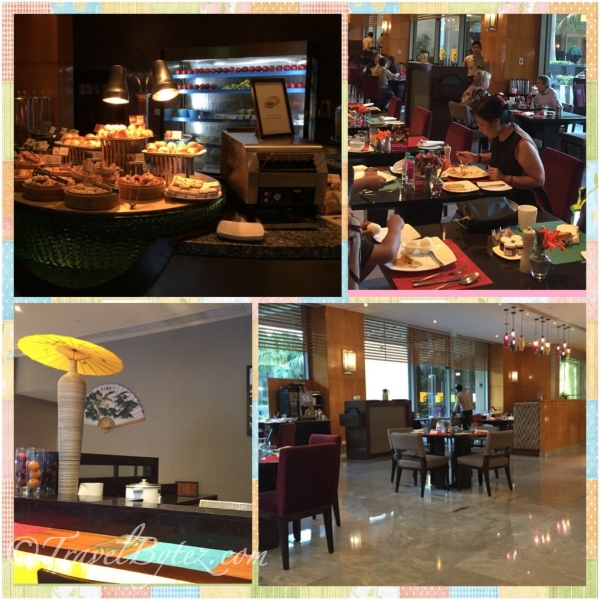 A sumptuous breakfast consisting of chicken sandwich, scones, croissant, fruits and drinks. If there was a gripe, it would have to be having to make multiple trips up and down to the reception over the course of 2 days because my card was deactivated, or the magnetic strip was spoilt. Not exactly good, especially when you are tired and all you want to do is get into your room, only to discover that you have to make that trip down again to get it fixed because your door won’t open. It was only on the second day that the receptionist deemed the card to be spoilt and issued me a new card. 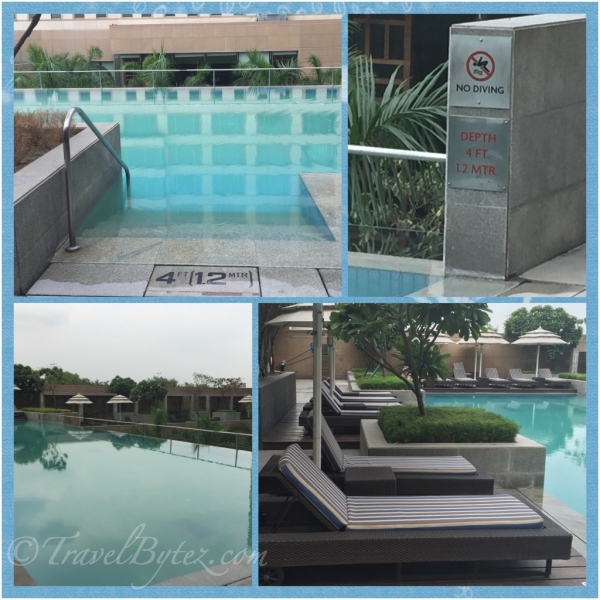 Other than that little boo boo, overall, it was an enjoyable stay at the Crowne Plaza Gurgaon, New Delhi. The level of service rendered and the level of politeness is almost on par with the Japanese – putting the customers first and making them feel special. So stay here if you have the budget and want to be near your office. 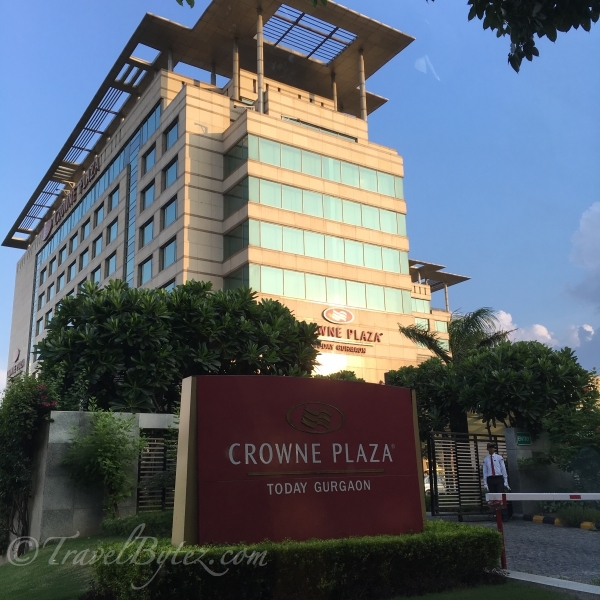 The Crowne Plaza is located about 15 minutes drive from the companies located in Cyber City, making it very convenient given the horrible traffic in and around Delhi.